There's good bling, and there's bad bling. You can get the good bling I'm showing you here, in three different sizes, for under $5, from Born Pretty. You can get a wheel of bling. Each of the three sizes has four compartments in the wheel. It's a bit difficult to see the size differences between the three in the blue mani up top, so I did another for comparison. 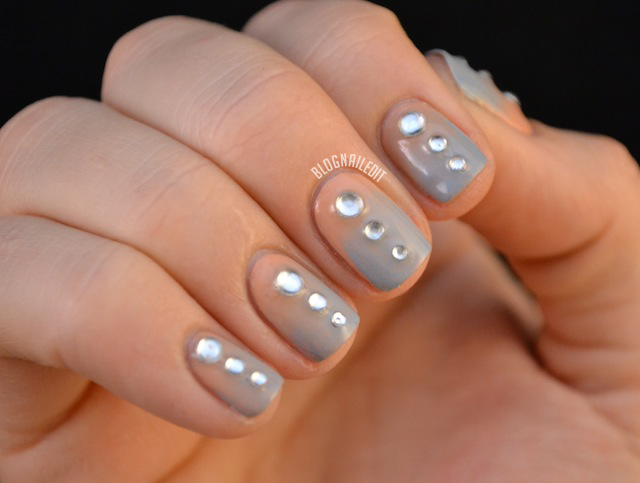 Which mani do you prefer with the rhinestones? 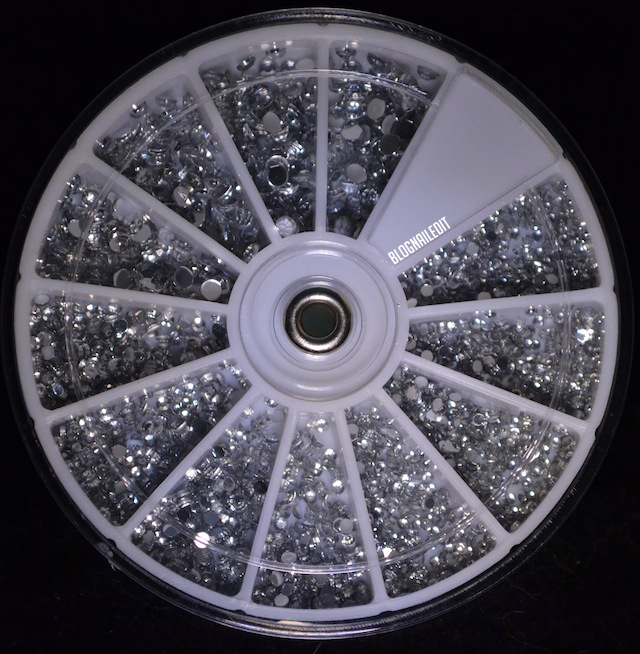 I loved this wheel of rhinestones. The three sizes were all manageable, but varied enough that I didn't feel like I actually just got two sizes. The easiest way to put them on is to use a toothpick with a little bit of tacky topcoat on the tip to pick up each rhinestone. The Nailasaurus shows you just how to do this using glequins, but the technique is the same. To avoid getting bubbles around the rhinestones, try not to apply too many layers of topcoat. ...It gets better though! You can take an additional 10% off your entire order by using my coupon code, C10X31. This product was sent to me by Born Pretty. The review is based entirely on my experience with the product and was in no way influenced by anyone. Definitely good bling! 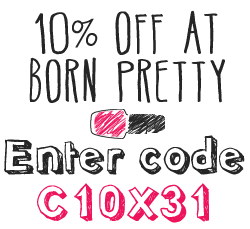 I love the born pretty store :D I might have to do another order with them soon! Love the picture comparisons! Hilarious! Those bling blings are pretty nifty, and CHEAP! I prefer the first mani. I found that anything but smallest of rhinestones doesn't work with the curvature of my nails - a lot of raised edges everywhere. Nice blings... gotta try these as well! I love the second mani! Both manicures are beautiful and elegant because of those rhinestones! Hi! I enjoy everyday with your manicures. Your manicure are awesome. 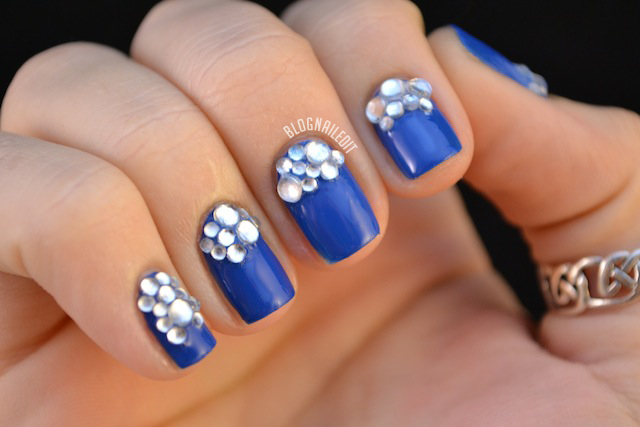 I like the first mani of this post, it reminds a luxury earrings or a jewel. Kisses from a spanish reader (and very loyal :D). This bling is super fun!! Bad bling?? That's what I'm wearing right now! I love a bit of nail bling. Goes so nice with the blue. I love that Essie shade. I'm usually too cheap to fork out the money it costs for Essie, and not a big fan of their colors...but this one is definitely one to own!